I never liked real ribs. The idea disgusted me and I couldn’t get into the taste, though I love BBQ sauce and like to have things to put it on. Hubby on the other hand grew up with ribs being his favorite things. As vegetarians we both agreed on our love for Morning Star Riblets, our only issue being they contain GMO soy and beets. So we were very excited to find out that Gardein was coming out with a new Riblet of their own and from everything I have read it does not have any GMO’s! This weekend we decided to give them a try. I will be completely honest. Usually if a product states that the best method of cooking is a microwave I won’t buy it. We don’t own a microwave and don’t like the taste of microwave food. The other two recommended options were a grill (which we also don’t own) and boiling, so we went with the boiling method. Next time I make them I am going to break the rules and try baking them. I feel the boiling method left them a little softer than I like so I think baking them will make them crisper on the edges. The texture was good. The sauce was a little on the sweet side for hubby and I so we decided to spice it up. Yeah, we could have just added a spicier BBQ sauce to it but there were still a ton of blackberries in the fridge! In a sauce pan saute onion and garlic in oil over medium heat until onion is translucent. Add coriander, ancho powder, and sugar for three minutes. Add blackberries and vinegar. Bring to a boil and simmer for 30 minutes, stirring occasionally. Prepare riblets according to package. Serve with blackberry sauce. Enjoy. 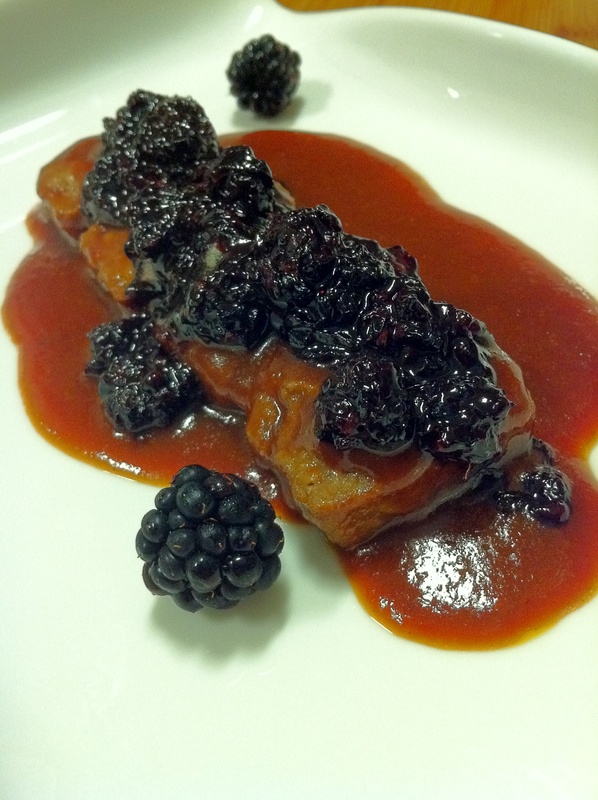 Gallery | This entry was posted in Gardein, Main Course and tagged ancho, blackberry, gardein, maple sugar, riblets, vegan. Bookmark the permalink.